Eco-friendly living is now trendy. Ten, even twenty, years ago only eccentrics were environmentally aware. Author Rebecca Tangueray shows that living in tune with nature has its benefits. While the "green" movement has grown from its grassroots origins making people more aware of the effects of pollution on health, it has lost its earthy image and today has become chic. Filled with enticing photographs and equally interesting explanations, Tangueray's book offers a model of good eco design for the 21st century. Unfortunately, the copy in the book, printed in a light gray, is extremely difficult to read and hard on the eyes. But the reader who employs a bright reading light will marvel at the information included in it. Tangueray begins with the basic principle of lifeeating. From there, she explores how readers can apply eco-friendly principles in any kitchen, although the images of high-style kitchens are a far cry from the crowded practicality of most. The once-eccentric alternative of eating organic foods, instead of being relegated to hippies, has become the fashion as supermarkets offer a wider variety of organic foods on their shelves. Tangueray helps the reader to know what to eat, where to shop, and how to avoid over-packaged foods. She even gives readers healthy recipes as examples. But eating right isn't all there is to living. Living and working in an eco-friendly space is just as important says Tangueray. Her vast experience as an interiors writer and editor shows itself as she explains the vices and virtues of flooring and seating, heating and cooling, colors and textures. Tangueray explores the world of "urban eco" design, in which recycling plays such a prime role. In it building equipment and supplies become useful everyday objects as hip designers use recycled waste products in creative new ways. This book is filled with eco furnishings, using natural textures and organic, flowing shapes. Ergonomic, the watchword of the 80s and 90s, has now evolved into "eco techno," the design of attractive, efficient equipment such as the iMac computer. 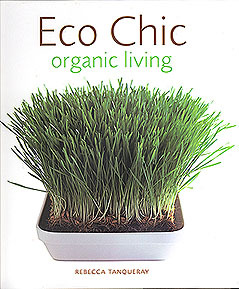 From inside to outside and all around the house, Tangueray helps her readers discover the magical world of "eco chic."